All your patients in one place. A super-efficient view of every device interrogation. Boost your clinic capacity, billable opportunity management, and, perhaps most importantly, team satisfaction. 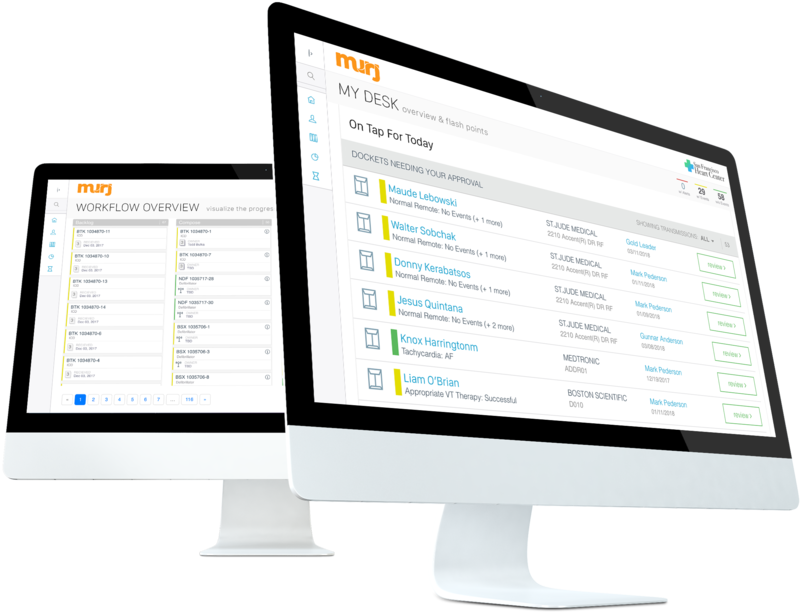 Murj uses the latest in high capacity SaaS infrastructure – it’s all safe and secure in the cloud. Remote monitoring can be initiated on Murj within hours of becoming a customer. Invite your whole staff—MDs, RNs, billing, anyone. No more seat licenses or incremental access fees. New features are available immediately. No downloads or CDs, just happy surprises. Do you want to start tomorrow? Receive, interpret, and approve a non-event transmission in just two clicks. 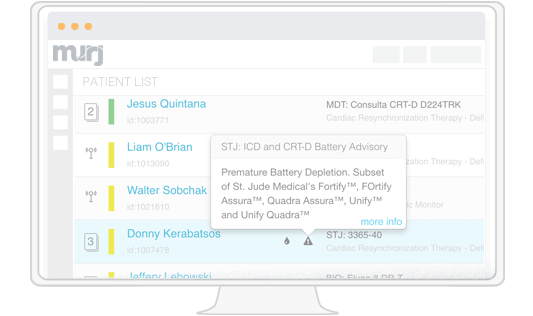 Murj handles device reporting with an ease and efficiency that will transform your clinic. Don’t leave recall to chance. Automatically flag all recalled devices. 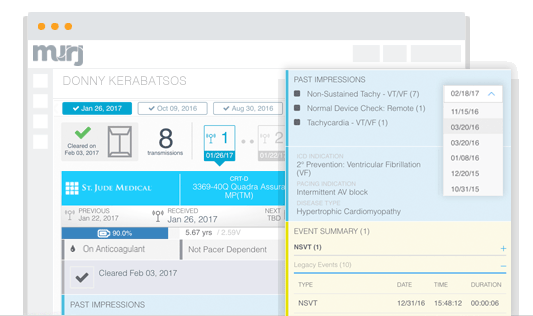 Quickly identify impacted patients. Track your progress and rest easy knowing it’s done. 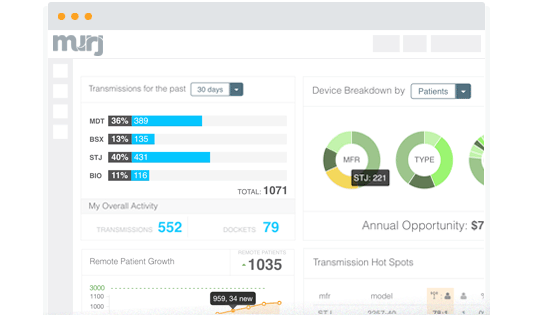 Murj’s analytics track all CIEDs, transmissions, impressions, workflow and billing opportunity. Set goals and see your clinic in a whole new light. All relevant historical impressions, key events and treatments are automatically available when interpreting a new transmission. No chart digging required. Instant help. 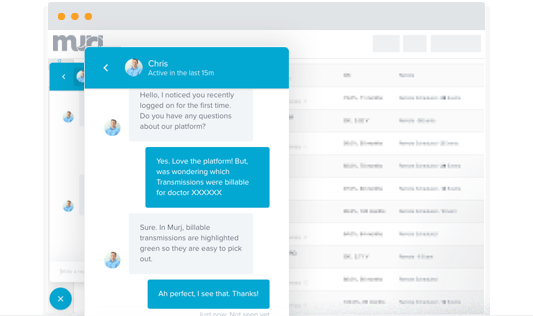 Chat in real-time with Murj product support while using the application. We are here to empower your caregiving. Opportunity to streamline and improve our ability to care for this growing patient population. Murj is efficient. Period. Their interface and attention to the clinic’s needs are outstanding! Remote monitoring of CIED devices is a Class 1-A recommendation.